In the last few days, a number of discoveries have been made regarding the Sonic 2 Remastered Edition. The first is a fully working Egg Gauntlet Zone, it is effectively a boss attack mode. However it was cut from the final game, whilst some of the assets from the stage remained in the game, it wasn’t possible to access without modifying the game. Furthermore, as Taxman explains, due to a recent game update, the stage assets have been cut, even through modding it’s no longer possible to access. But… there is one other very interesting discovery and revelation. Sonic 2 remastered has a hidden stage which is accessible in the current release via a cheat code. For younger readers. Cheat codes are what we used before DLC was invented. The new stage is called ‘Proto Palace Zone’ and whilst you may think ‘it’s Hidden Palace’ it’s actually different. It’s based on the original prototype stage which was on show at that toy event way back in the 1990’s. And here is how you access it. Step 1: Access the Sonic 2 level select code. (Tap the letters in the SEGA logo from left to right, then put two fingers on the title screen). 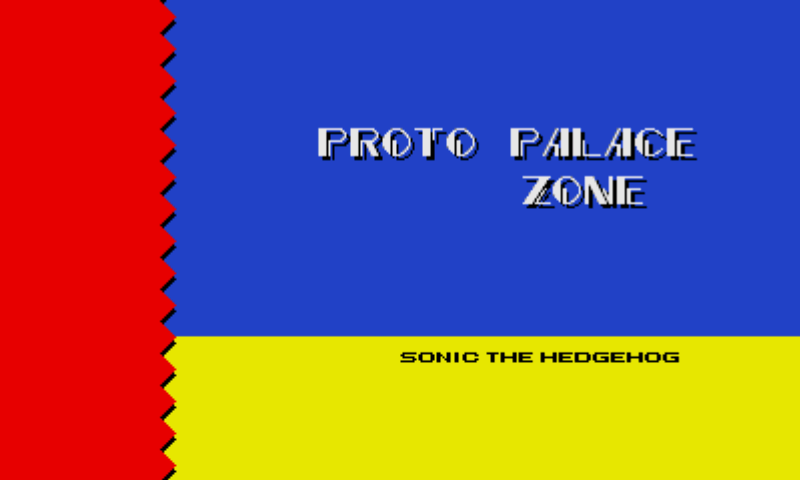 And that’s it, you are now playing Proto Palace Zone, which include the original ‘track number 10’ music. But if you don’t have the remastered edition, here’s a video of the stage. The best part is where you explained what cheat codes were! Haha, it’s crazy to even think kids wouldn’t about cheat codes.. So the scrapped version of HPZ uses the proper BGM but the regularly playable one doesn’t? WTF? They already explained that they used Mystic Cave 2P because they didn’t feel the original music suited the pace of the zone they ended up designing. Obviously this is a bonus extra used to evoke the original footage we had of Hidden Palace, so they used the original theme. I think I believe this code doesn’t work on my Amazon Appstore version for some reason. The first debug code which as far as I tell is familiar to the original game works, but the second code which speaks too much Mystic Caves and Track 10s doesn’t probably work. Is Taxman teasing us by adding in and removing scrapped things or something? HogFather, I just tried this, and it’s legit! It’s also worth noting that this ‘cheat code’ works on the remastered version of Sonic 1 as well with a variety of options like turning the speed cap on/off and the spin dash! The cheat code 03,03,03,0B,10,10,10,04 – which allows you to play the Prototype version of Hidden Palace in Sonic 2 (which is awesome by the way) does not work on the mobile version of Sonic 1. That code is only relevant to the mobile versions of Sonic 2. Wow! Sorry about the double post, but you can even give Sonic the instance shield from Sonic 3! Ok what am I doing wrong. I have two fingers on the title screen after I tap the letters in the Sega logo and I’m only getting the Emerald Hill Zone Act 1. Do you hear a ring sound after tapping the letters left to right? Figured it out for you. This only works in No Save Mode. already went to that mode. touch the title screen with two fingers, but only Emerald Hill Zone and no stage select. You have to be very precise with how you tap with two fingers. If there’s any amount of delay between the fingers tapping the game will just send you to Emerald Hill. What I do is use my left middle and left index fingers and just tighten and lower them together at the same time to tap the screen. Works everytime. Ok I didn’t have my fingers in the right locations on title screen. Justice has been done! Playing the true Hidden Palace on an official Sega game and with the better (my opinion) music, I almost started crying. I have spent many hours looking into the scrapped Sonic 2 stages thinking how cool it would of been to play them. Sure I played the hacks, but it wasn’t the same as playing on an authentic Sega made version. I am so happy right now and I hope all of you are too! Pfft. XD I miss cheat codes. I really liked the pointless ones that gave you a giant head or the ones that gave you extra costumes. Like in Fur Fighters, you get the former. Anyway, this stage looks really fun. The music sounds a lot like the Death Egg music as well. I really love that this Hidden Palace is an exact replica from the one found in the Simon Wai Prototype. Just the fact that they dedicated time and work to bring this secret and keep hush hush about it shows how much dedication they’ve put into this. I saw that little Tails 1-Up monitor! Dear Sonic Stadium PLZ READ URGENT NEWS!!! Before DLC, there was a thing called lock on technology. For those of you having trouble with the code. Make sure your sonic 2 is up to date. I had not updated mine and the code did not work until I updated the game. Whats the code to get the retro dev menu working and how to get to play the egg gauntlet? I think you need to re-read the post. There is your answer. It’s no longer possible to access. So even if you get the retro dev menu you won’t be able to play the Egg Gauntlet as every thing is removed completely. if its impossible how is that person able to play it on the video? I heard it was accessable on the first version released 3.0.1 (which is the version i have) so the question is in what way does the game need to be modified to play this zone? What version is being used to play that zone, is it a developers version or something? This is clearly explained in both the article and the comment you’ve just replied to. Well how to mod the older version has not been explained the article just stats that its impossible due to a recent game update. Which would assume that its only impossible to access in the later versions. This is a rather fascinating “yet hidden” call back to the original Hidden Palace Zone. It seems what was hidden will always be in some way. Now I wonder, if any other zones such as Casino Night Zone also has a beta secret call back as well. That would be cool to play the Bets version of Casino Night. Too bad that we still can’t get Wood Zone. The funny part is, after going through Egg Gauntlet Zone, Boss Attack Zone comes up.